The moon like a hand grenade. Pour forth like a second flood! Thunder the alps of the air! International Workers’ Day (May Day) is back in earnest – though in some nations the voices have always been there, only elbowed out by the slickness of advertising and the ruthless editing of media in an all-round cacophony of contemporary life. Here in Toronto the Occupy Movement has joined forces with No One is Illegal to draw attention to the economic vulnerability of refugees and “hidden” immigrants. 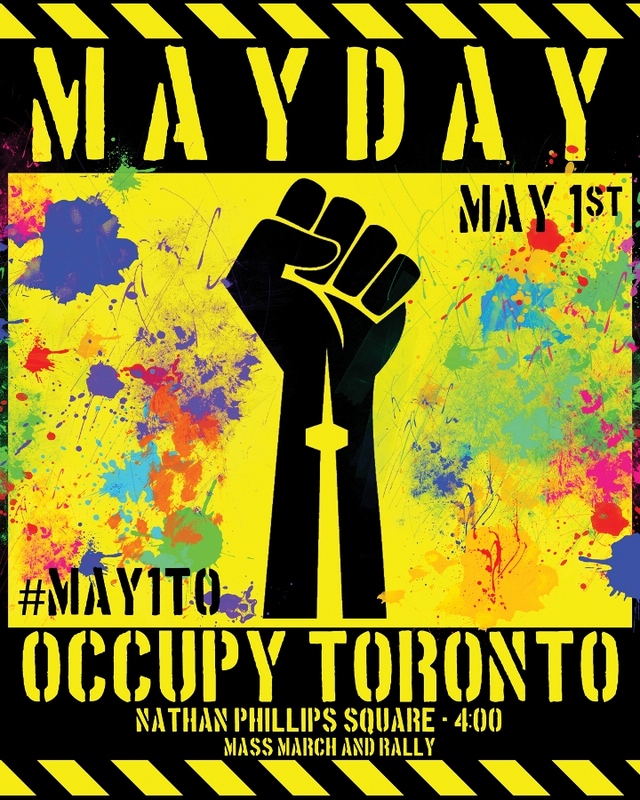 Though few of Toronto’s 2012 marchers will cry: “Up with the hammer and sickle!” as does the inspirational voice in the above poem (set in Depression-dreary New York City) by British-American writer Alfred Hayes (1911-1985), surely the same energy and enthusiasm will be felt. But, considering the system, I’ve lived too long anyway. (rebellion and protest are not the same thing). save for the FLQ Crisis and, later, in 1976, the victory of the Parti Québécois. of idealism, pessimism and humour – uniquely his. Our folded hands again are at the loom. But what we weave you see not through the gloom. You dream that we are weaving what you will? And Hunger moves the Shuttle forth and back. A shroud it is; a shroud of ghastly black. We’ve never let you lack! See how the Shuttle goes! Several thousand Paterson, New Jersey, textile mill workers went on strike for six months in 1913. They were demanding a shorter work day – 8 hours instead of 12 – and an end to the use of child labour. Many women were involved and more than 1800 silk-weavers were arrested during the strike, which, though failing to produce any immediate results, put workers’ rights front and centre as a matter for public and political action in the USA.